If you are sick and tired of struggling with your overhead garage door, call the experts at Stephen’s Garage Door Company. We specialize in the installation, maintenance and repair of commercial and residential garage doors. For more than 15 years, our professional staff has offered garage door services using only the highest quality materials and most trusted brands. Businesses and homeowners alike can count on the professionals at Stephen’s Garage Door to inspect their garage doors and provide maintenance or repair work as needed. For those who have grown tired of fighting their old and worn-out garage door, our repair and maintenance service can upgrade a manual door to a manageable automatic system. 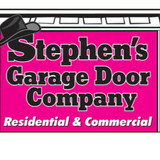 Providing quality products and dependable service are priorities at Stephen’s Garage Door Company. Regardless of the job requested, our customer service oriented staff works closely with clients to ensure they are happy with the result. Stephen’s Garage Door Company accepts custom orders for both function and style. We can tailor the size, color, embellishments, windows and details of each garage door as requested. We also carry garage door accessories including remotes and security keypads at sensible prices. Security, durability, and good looks are built into every door installed by us. Request a garage door service quote online or call us today at 207-939-9686 for more information. Our service areas also include Auburn, Lewiston, Cape Elizabeth, Portland, Scarborough, Gray, Raymond, Windham, Cumberland, Yarmouth, Durham, Poland, Casco, Naples, Brunswick, Freeport, Westbrook, Falmouth, Lisbon, & surrounding cities in Maine! What types of garage door service tasks do contractors in Portland, ME provide? A damaged garage door can lead to increased security risk, ruined belongings and an unpleasant exterior, so look for Portland, ME repair professionals who provide same-day or emergency services if the damage is extensive and poses a potential health and safety risk. Find Portland, ME garage door repair professionals on Houzz. Narrow your search for garage door repair professionals by selecting the nearest city or zip code. Look at portfolio and product photos, and read reviews to find the best garage door contractors in Portland, ME for your home.